Hi, just got this local stamp in a mixture I received today, it reads Stow Local Post 2011 and is a Christmas stamp. Am I right in assuming that this is an American local? There is no indication of value on it so it is purely a guess. Yes, it is a Stow Local Post and I know the father of the artist! He's going to get a kick out of seeing this! I'm going to email this thread link to him. Philatarium, you will probably recognize this, too! If anybody asks you can say, "Yes there is a USPS authorized local airmail postage issuing entity." It is the Rattle Snake Local Post. Where in the world is Rattlesnake Island, you ask? At the western end of Lake Erie lies a small archipelago known as the Lake Erie Islands. Three of the larger islands lie in a north-south alignment: North, Middle, and South Bass Islands, the latter being the best-known due to the town of Put-In-Bay, a popular tourist mecca in the summer months. Lying approximately 2-miles to the west of Middle Bass Island and 11-12 miles north-northeast of Port Clinton, Ohio, is an 85 acre island known as Rattlesnake Island, little-known until 1966, when it become the location of the only airmail local post in the United States. Historically, the area was first home to the Erie Indians, then the Ottawa and Huron's, and later the Iroquois. It is thought the island received it's name from these Native Americans due to distinctive rock formations on the island; while others say it was due to timber rattlesnakes which were prevalent on the island at that time. It wasn't until the United States' second war with England, the War of 1812, that the area was finally taken over by settlers. The former native inhabitants were transplanted to reservations in Kansas, and, later, Oklahoma. During the War of 1812, the area first received prominence. The invading British had been using the bay at South Bass Island as a base of operations, calling it Pudding Bay. On September 10th, 1812, that changed when Lt. Oliver Hazard Perry defeated the British in the Battle of Lake Erie, and uttered the immortal line "We have met the enemy and they are ours….." Subsequently, Pudding Bay became Put-In-Bay. Legally, since colonial times, the Lake Erie Islands were part of the Firelands Section of the Connecticut Land Company's western reserve. In 1854, Abigail Dunning of Hartford, Connecticut, sold Rattlesnake Island to Horace Kelley of Cleveland, Ohio. Soon thereafter, post offices were established on South Bass Island (1860), North Bass Island (1864), and Middle Bass Island (1864). Rattlesnake Island was largely uninhabited at the time. The modern history of Rattlesnake Island began with the purchase of the island about 1929 by Herbert Bennett, the owner of the Toledo Scale Company, who developed the island by putting in a lodge, harbor, and east-west landing strip. A second north-south landing strip was added in the 1950's by a Catholic order. In 1959, the island was sold to James P. Frackelton, M.D., a Cleveland surgeon and owner of the Cleveland Stamp and Coin Company, and Robert C. Schull, a stockbroker. Subsequently, Dr. Frackelton applied to the U. S. Post Office Department under Title 18 for the establishment of a local post for the island, as repeated requests for regular mail service had been denied. The history of local posts (private mail-carrying entities) in the United States goes back to colonial times. Their popularity peaked in the first half of the 19th century. By the early 1860's, the expanding Post Office Department had made them largely obsolete. Arguably, the most famous of them all was the Pony Express, which existed from April, 1861, to October, 1862, replaced by the telegraph. The story of modern local posts began with the success of Herman "Pat" Hearst's Shrub Oak Local Post, Shrub Oak, New York, in 1953. Since then, there have been at least 127 others documented, including Rattlesnake Island Local Post. In the early days, mail was delivered to the island by boat in the summer, and horse-drawn sleigh in the winter. Many a harrowing story was associated with these methods. By 1959, Ralph Dietrick, a veteran World War II pilot, and owner of Island Airways, was providing mail service to North, Middle, and South Bass Islands utilizing the famous Ford Trimotor, or "Tin Goose," as it was affectionately known. This service was enlisted by Rattlesnake Island Local Post upon it's inception, adding not a little bit of philatelic and aeronautical romance to the story. So much so, in fact, that the 1966, 1967, and later the 20th Anniversary stamps all pictured the Ford Trimotor on them, as well as one of the rubber handstamps applied to most mail. Approval from the Post Office Department was finally obtained in 1966, and the first stamps, rectangular in shape, were issued on August 27th in three denominations: five cents for postcards, ten cents for letters, and 25 cents for bulk postage - all three in perforate and imperforate form, a practice which was to continue with each years' issue. 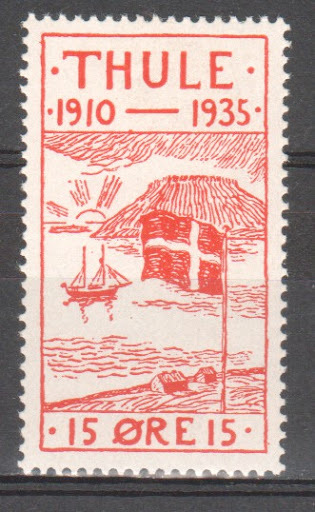 The five-cent stamp (black and light gray with red text) depicted a map of the island; the ten-cent stamp (pale green with black text) depicted the Ford Trimotor approaching the island; and the 25-cent stamp (pale blue with black text) depicted a boat at the island's dock. Of course, additional U. S. postage had to be applied to each item in order to effect entrance into the U. S. postal system at Port Clinton, Ohio (the 1st class letter rate was then five cents). However, on December 9th, 1966, Dr. Frackelton received a telephone call from the Post Office Department, followed by a letter on December 12th, indicating that Rattlesnake Island Local Post was in violation of Section 475 of Title 18 of the U. S. Postal Code, and was ordered to cease operations. Subsequent investigation revealed that the rectangular stamps were too similar to then current U. S. postage. This was remedied by the resourceful Dr. Frackelton by using the same designs in a triangular form, which won approval. 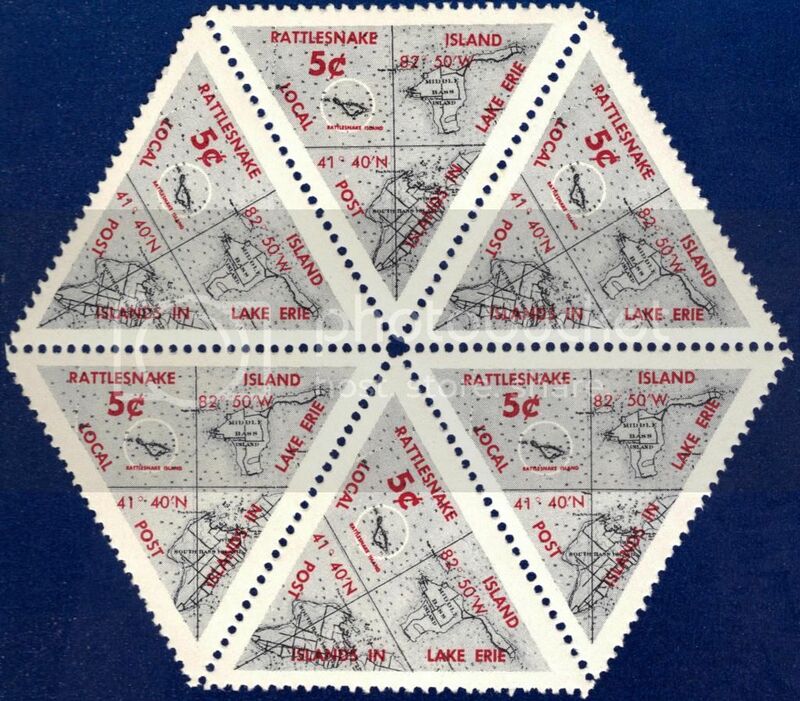 On January 23rd, 1967, the first Rattlesnake Island triangular stamps were issued. The period between December 9th, 1966, and January 22nd, 1967, would become known as "the stampless period." All mail during this time was simply franked in handwritten script "Fee Paid." These items are highly sought after by collectors. 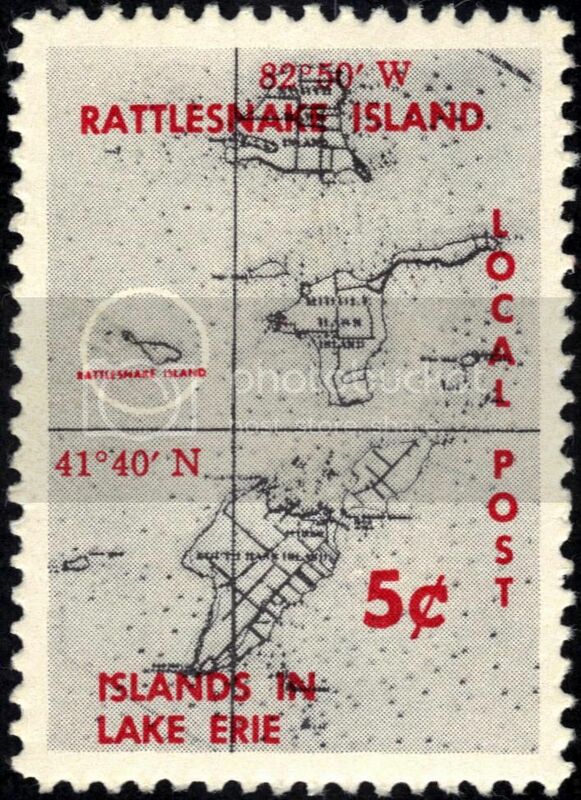 With the pattern of 3 triangular stamps, perforate and imperforate, issued each year, Rattlesnake Island Local Post became well-known to collectors worldwide. Each sheet consisted of 20 stamps, and, starting with the first triangular issues of 1967, each sheet bore a plate number. Plate blocks of the triangular issues of 6-stamps with appropriate selvage. FDC's consist of two types: those postally used (fig.4), and CTO's, all bearing the Rattlesnake Island and Port Clinton, Ohio, postmarks. These attractive stamps were designed by Dr. Frackelton (1966-72), Bernice Kochan (1973-77), Trisha Marcum (1978), and Robert Eisenbarth (1979-89). Unfortunately, there were a total of 3-postal rate increases over the span of the 24 years that Rattlesnake Island Local Post existed. The final rate increase occurred in 1981, and, by that time, the postcard rate had increased to $1.00, the letter rate to $1.50 (the U.S. 1st class letter rate was .25¢ at the time), and the bulk rate to $2.00. When one considers that a full set of 3-stamps, perforate and imperforate, had jumped from .80¢ in 1966 to $9.00 in 1989, and a full set of sheets from $16.00 to $180.00, it was inevitable that economic concerns seriously began to affect the market. 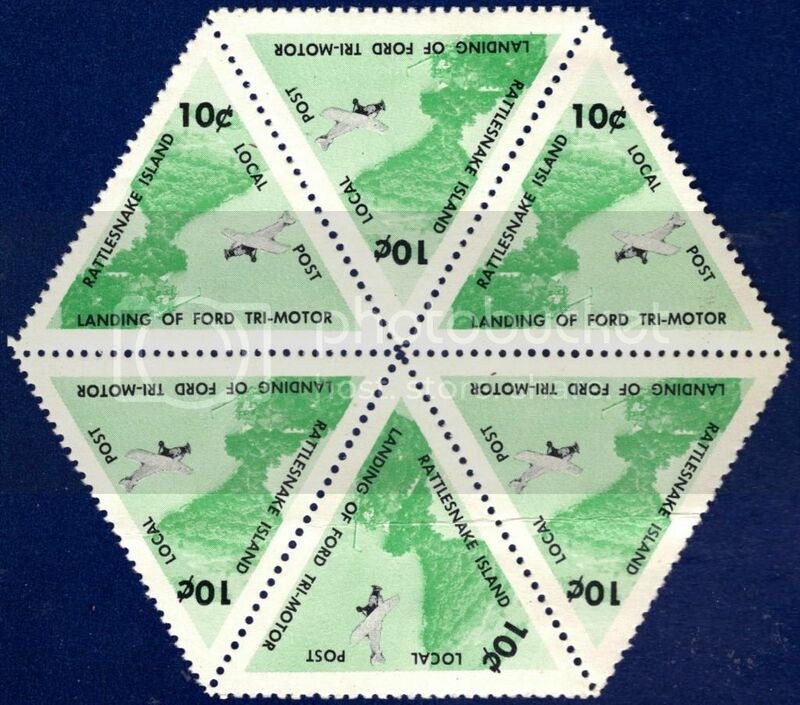 As a result, the stamps from the 1980's are the more difficult to find today and are avidly sought after by collectors. These economic concerns, coupled with the sale of the island in 1989, brought to a close this colorful chapter of philatelic history. But that is not the end of the story. No sir. Dr. Frackelton and 65 other investors repurchased the island in 1999. 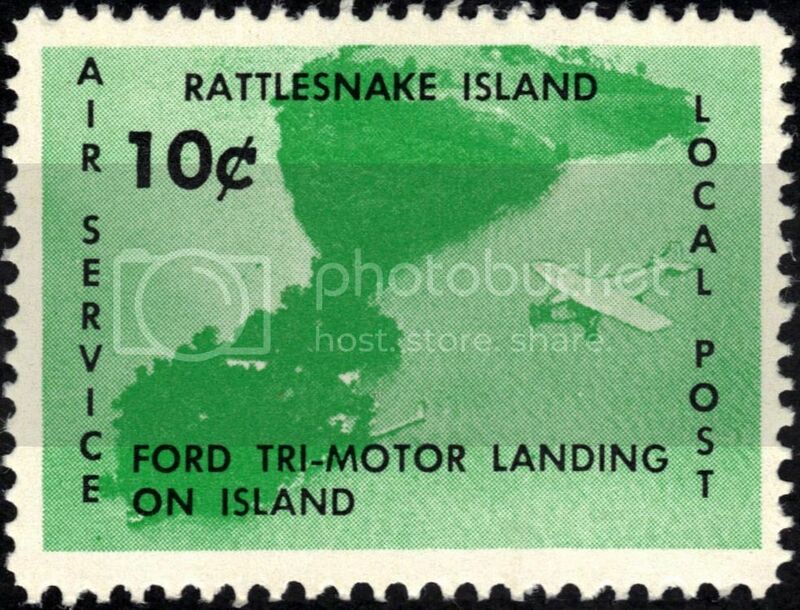 On September 23, 2005 they began issuing the Rattlesnake Island Local Post again. The new stamps were issued in three denominations as before for post cards, letters, and parcel post. The post card stamp featured a photograph of the island airstrip and marina and sold for 25¢, the letter stamp a photograph of the northwest corner of the island for 50¢, and the parcel post stamp a photograph of the island marina for $1. They were issued in perforated and imperforate formats as before. Unlike before the new stamps were not processed through the Port Clinton, Ohio Post Office but processed through the Post Office at Sandusky, Ohio. Every year a new set of stamps have been issued. They generally show scenery on the island, feature Lake Erie history or the local flora and fauna. There certainly is a lot of interest for topical collectors. 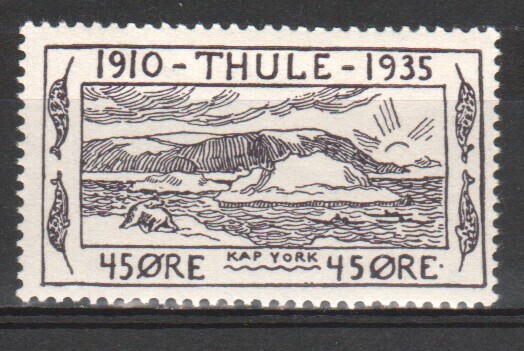 Thule in NW Greenland produced five stamps in 1935-1936. 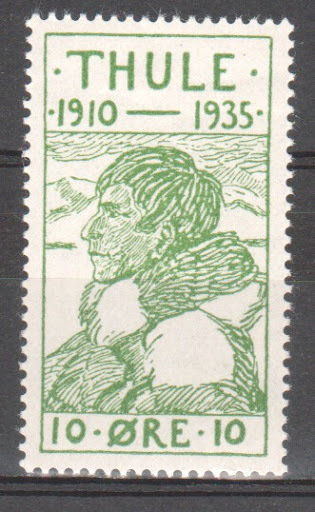 The original four were at first intended just as labels to commemorate the 25th anniversary of the place, the most Northerly trading post in the world: but they came to be used occasionally for local post up to 1938, when regular Greenland stamps were used, even though Denmark allowed free post from Thule to the Danish mainland. There were also cryolite mines in the area. In 1953 the Danish government moved the population to a new settlement at Qaanaaq, 60 miles further North, to make room for the expansion of a US air base. In 2003 a Danish court awarded them compensation for this. Here is one of the stamps. There are reprints of these stamps around, but these are, as far as I can gather, ungummed. 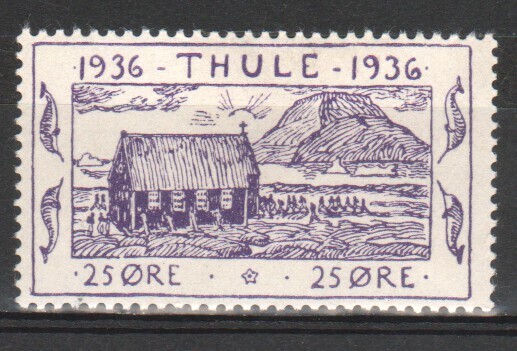 The fifth Thule stamp of 1935-6. 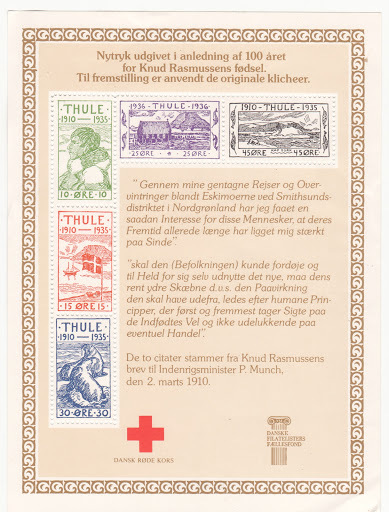 In 1979 a miniature sheet was issued, in aid of the Red Cross, reproducing the Thule stamps of 1935-6. I saw another thread for local posts and now I can't find it so I will post my locals here. These are from Kaulbach Island. A small island in Mahone Bay, Nova Scotia. I just Googled it and it is now for sale and can be yours for a mere 7 million. 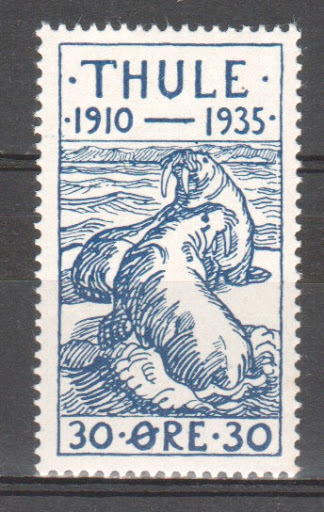 This was a private island and they issued Local stamp issues from 1971 to 1984. Were only used on mail from the island to the mainland of Nova Scotia, a grueling 6 min. boat ride. They could only be used on the back of the envelope and Canadian Postage was used on the front before dropping in the regular mail. Following and the issues of Kaulbach Island. More pages of Kaulbach Island Local Post. No self respecting Local Post stamp issuer would be found issuing stamps without a printing "error". This one is no exception. In the Rotary issue - stamp 3 has a break in the inside ring of the wheel at the 5 o'clock position. The last of my Kaulback Island issues. And of course we must have a 10th anniversary issue. Simply overprint the first issue. As all things must end, we should have a "end of service" issue. Just pick a sheet, any sheet and overprint it. I have not seen these for a long time...when I was a kid, a friend of mine had a complete strip of the Kaulbach island bird stamps. I remember looking at them and he gave me a duplicate of the Kingfisher which I still have to this day in my Canada commemorative stock pages...back of the book, as it were. Seeing the Kaulback Island locals reminds me of the mistakes things of youth and inexperience. i once had a huge stash of these locals. Grew up not far from there and somehow my mom got me a hoard. I kept them for many years and moved them around during university years. Eventually , I threw them out while packing for a move. I knew they were locals and my thinking at the time was « worthless » as could not be used for postage. Big mistake. Did not know they were collectible and in those days did not have ressources like the Forum to make inquiries. I think that is why I throw nothing out these days. I try to find a home for things that are not in my « collecting » interest. One learns from mistakes and moves on. Life is too short for regrets.